It’s mid summer here at Melliodora. The days are hot and the cicadas sing in the trees all around. 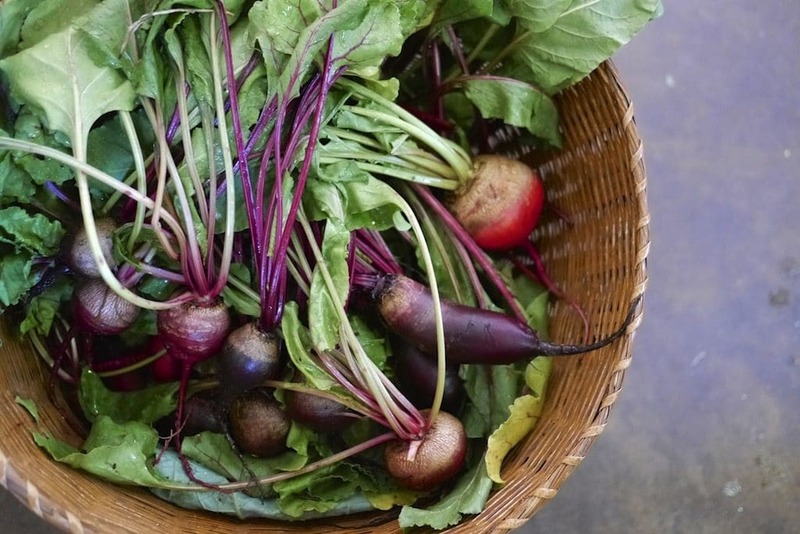 It’s a time for berries, plums, treehouse builds + giant zucchinis. 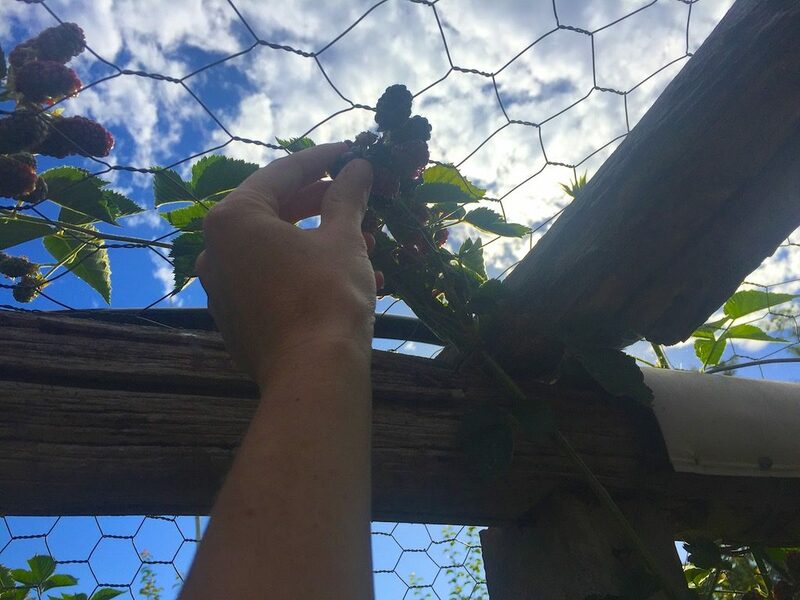 We rise early before the heat starts – to water precious plants, to twine climbing tomatoes so they can reach high, to just sit outside with a precious steaming coffee and drink in the grassy smell of early morning. Before long, the sun is up and it’s time to get busy before the real heat sets in. Milking the goats and then walking them down to the gully, where they’ll stay all day, eating blackberry tips, hawthorn and weeds. We’ll bring them back in the cool of evening. We finished planting the mountain of seedlings we raised into the various annual garden beds just before the solstice, and now it’s time to consider the next rotation in each bed. 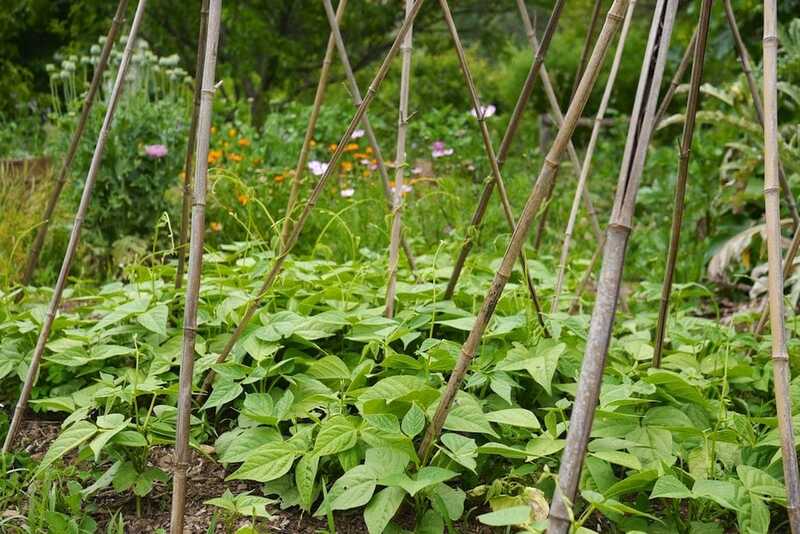 Root beds give way to fruiting plants, fruiting plants give way to leafy greens, leafy greens give way to legumes or green manures. Around the cycle it all goes. Except because of the very late and very wet Spring, nothing is on time – the tomatoes are late, the brassicas early. Nature doesn’t always do what the packet says. We wait and we watch. Learning this new place. The berries are everywhere. 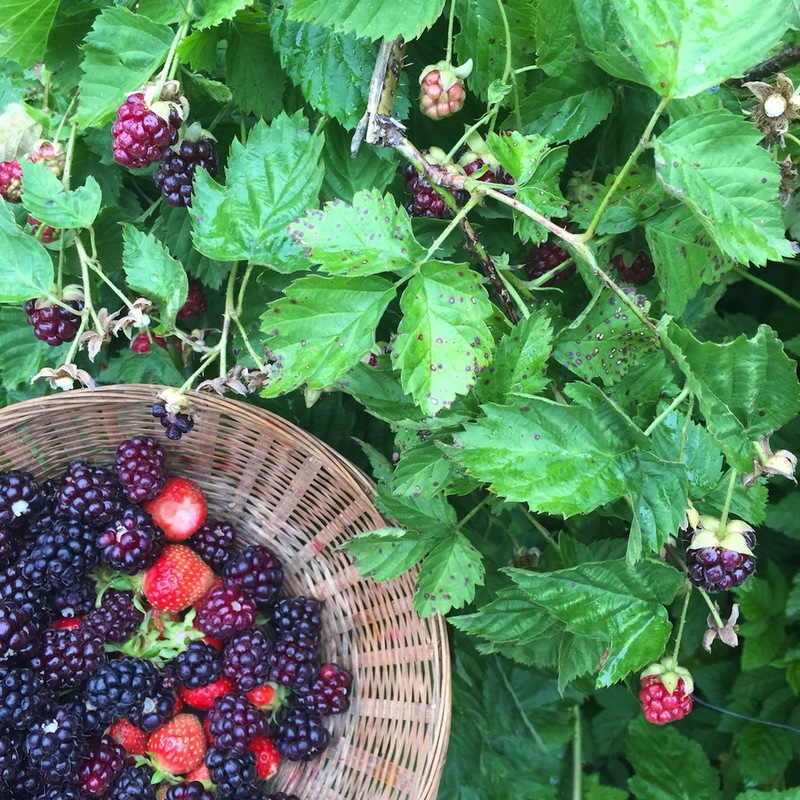 First the raspberries and strawberries in the top garden, then the white mulberries and bramble berries down in the red soil garden, then the logan berries along the chook run. The gooseberries hide well, but 7 year old Ashar finds them all. Motivation is a child on a farm, searching for berries. The cherries have come and gone. 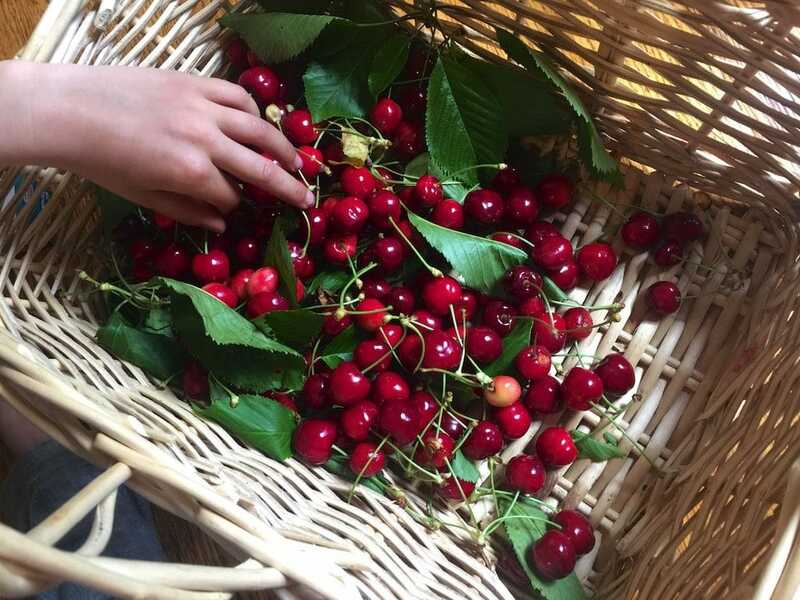 We netted the two huge trees, and waited, and then picked bucketloads when they went shiny red-black. Everyone up the tree at once, buckets in hand. Another person at the base, watching for dropped ones. So many. We stood in crooks of branches and picked until our wedged feet went numb. Back at our cottage we ate and pipped and pickled and preserved those cherries until they were all gone. Cherry jelly on pancakes. Stewed bird-pecked cherries on granola. Steam juiced cherries. Jars of spiced cherries for winter porridge in the pantry. And a big jar of drunken cherries, steeping in grappa with spices and sugar, for winter nights when friends come around. 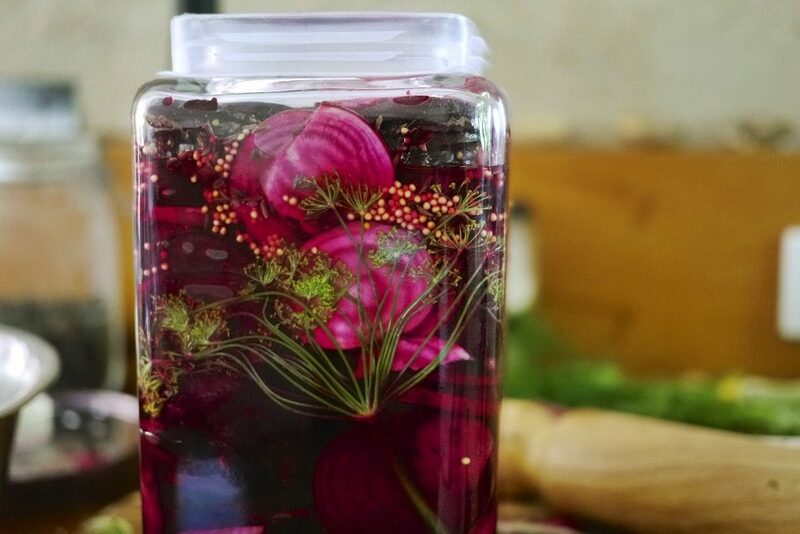 The label on that jar says ‘do not open until it is a dark night in July’. 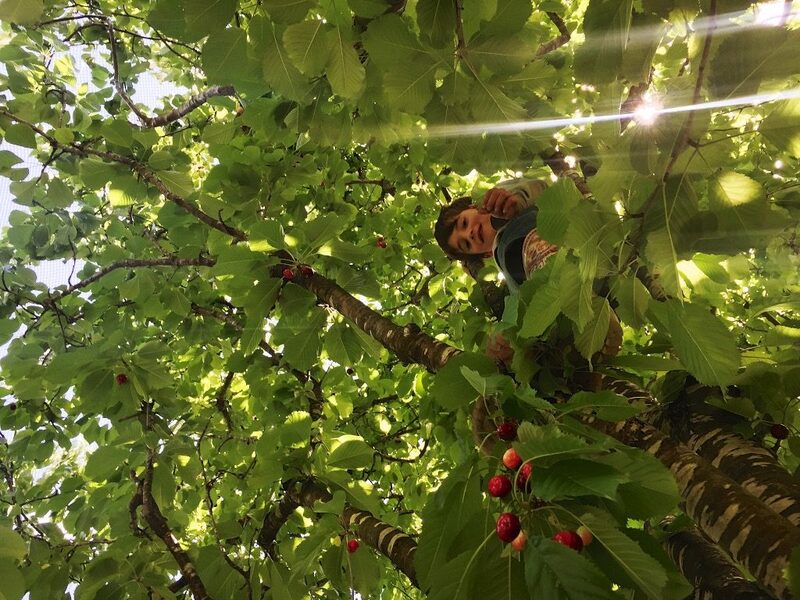 We’ve got an idea of how long winter is here now, and its pretty clear that the many misty (or just plain wet) short cold days and long colder nights require occasional outbursts of drunken cherries. 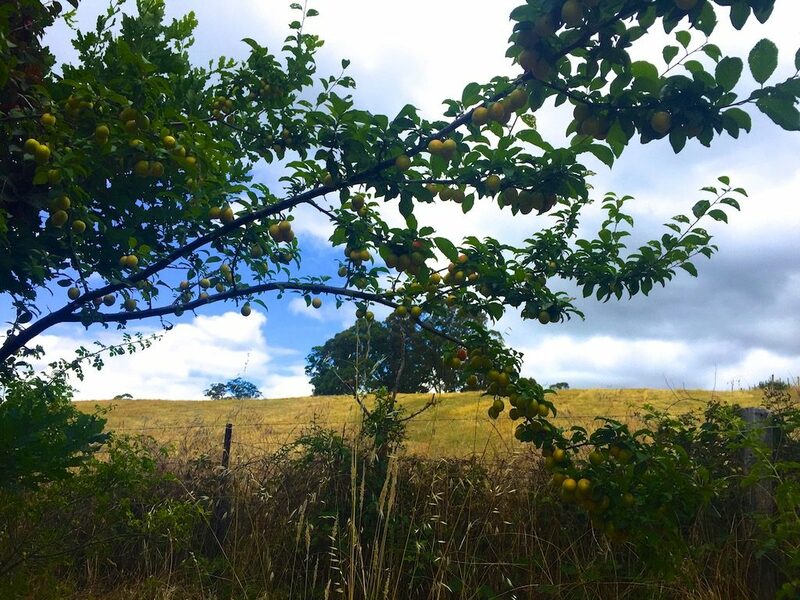 Many of the trees in the permaculture orchard here are still ripening. The apples, the pears, the nashis, the hazelnuts, walnuts, olives. 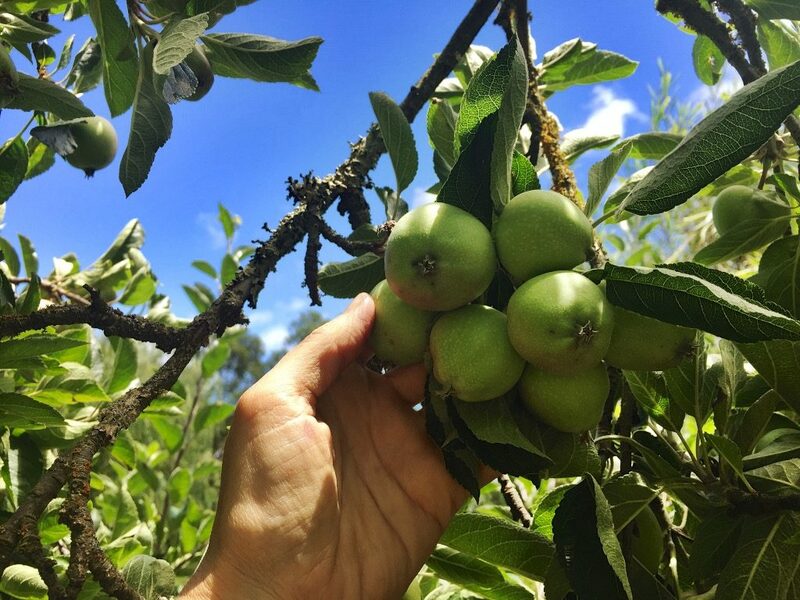 David says that the apples need thinning – needed thinning a month ago actually, but that’s life for you – so we learn how to do it and go from bunch to bunch, from tree to tree, and remove all but 1 or 2 of the best apples of each cluster. This helps the tree put all its energy into the remaining apples, for strong healthy fruit. The geese follow behind, eating the fallen apples as fast as we let them fall to earth. They hiss at me if I’m not going fast enough. 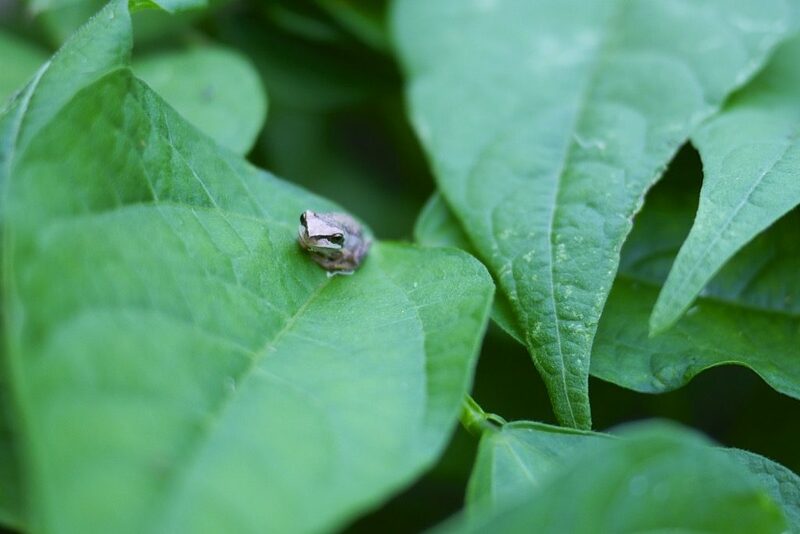 Brilliant orchard helpers, if sometimes a little hissy. 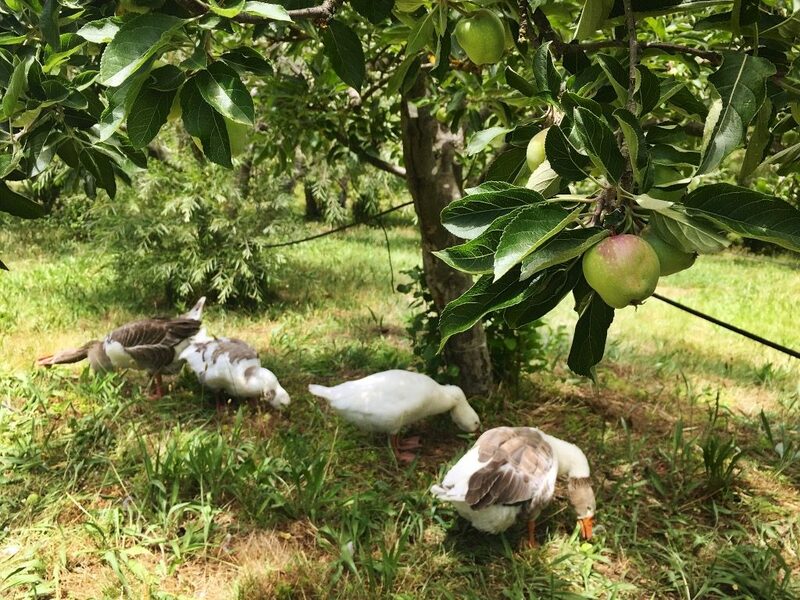 They’ll eat all the fallen fruit on this entire farm, reducing pests and disease and getting fat for the cold months of winter. 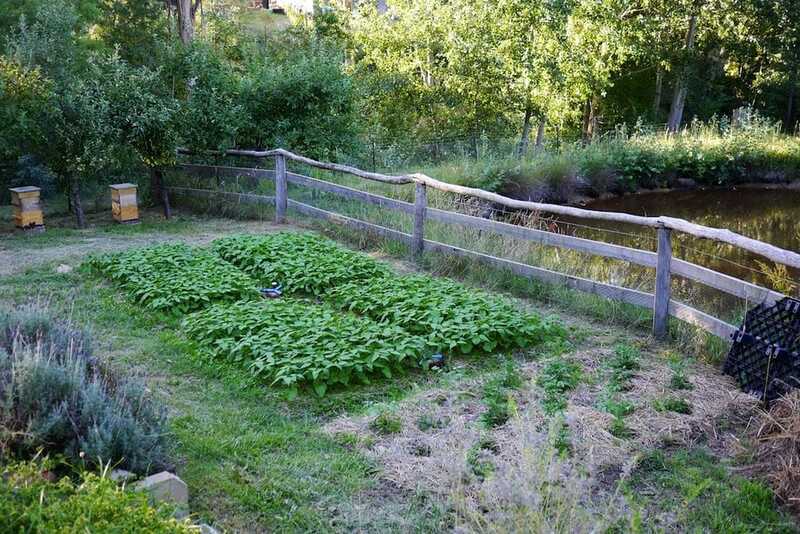 The annual vegetable beds are full of eggplants, capsicums and tomatoes, ringed by root crops and spinach. They’re all late off the mark this summer but growing well, though the difficulties with growing tomatoes at this site continues… yellowed leaves at the bottom of many plants. 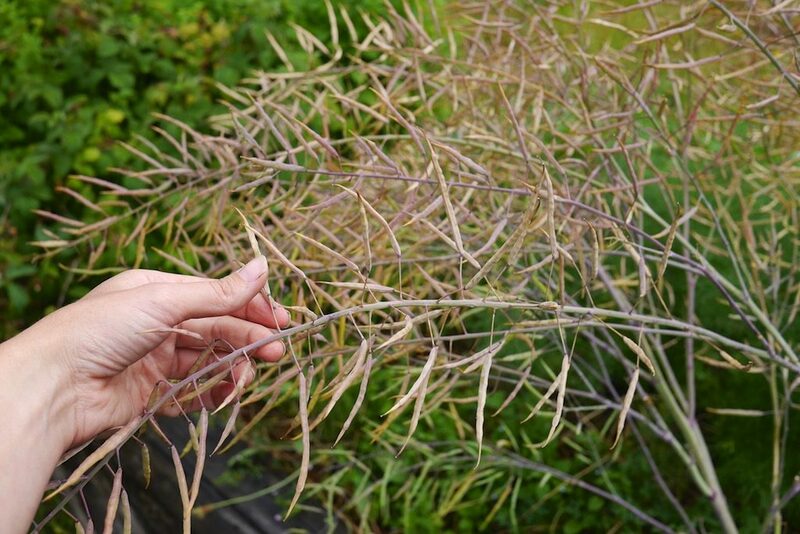 The problem might be nematodes, or it might not be. We’re hoping good soil prep, crop rotation + lots of flowering plants + compost can fix this issue long term. We will see. Theres is plenty of other food if the tomatoes don’t do well this year. Such is the nature of diversity. 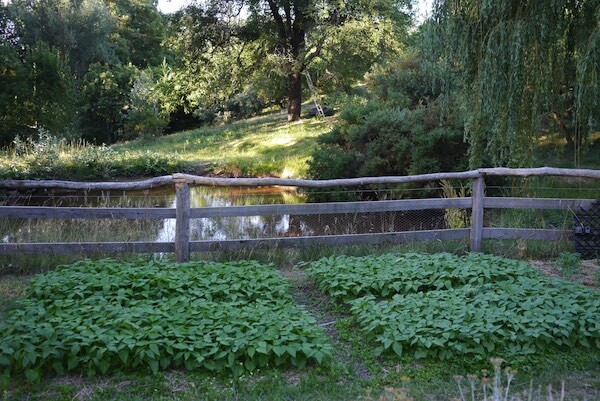 The biointensive bean beds in the red soil garden are growing strong, except – guess what? 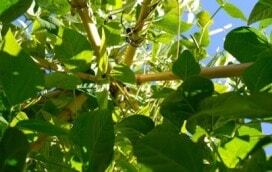 – both types of beans, which we believed to be bush beans so planted and spaced them accordingly, are actually climbers! Darn. They should still crop well, even if they look a bit messy as they scramble. 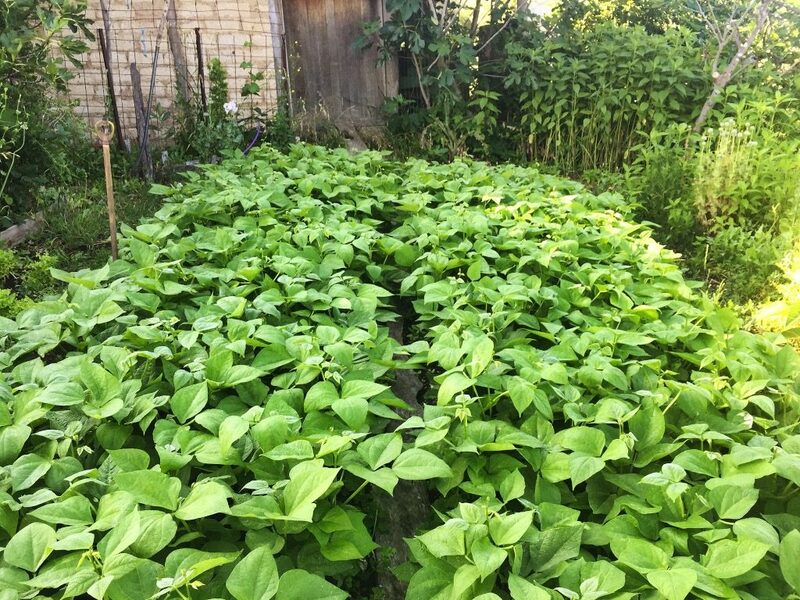 We put up some teepee trellises for the calypso beans, and won’t bother with the kidney beans (climbing kidney beans – who knew). It won’t look picture perfect but if we get a good yield of storage beans, who cares. Live and learn. 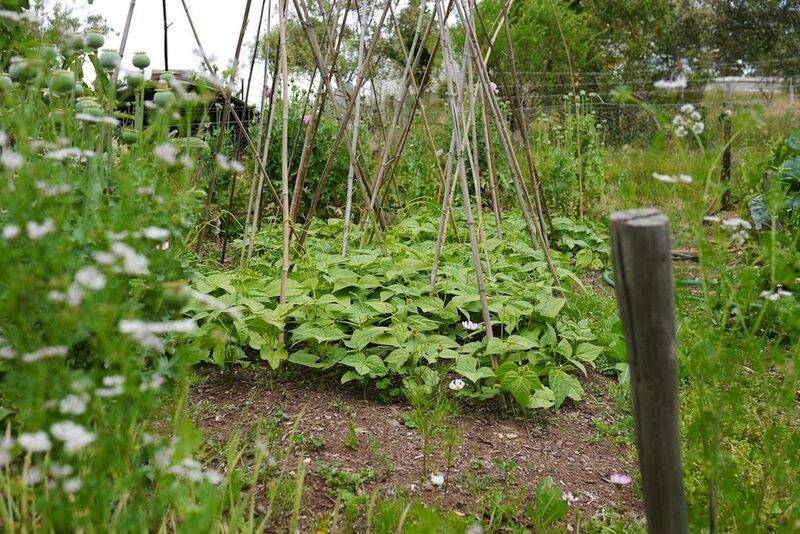 Down in our cottage garden is another big biointensive bed of roma tomatoes and more kidney beans. 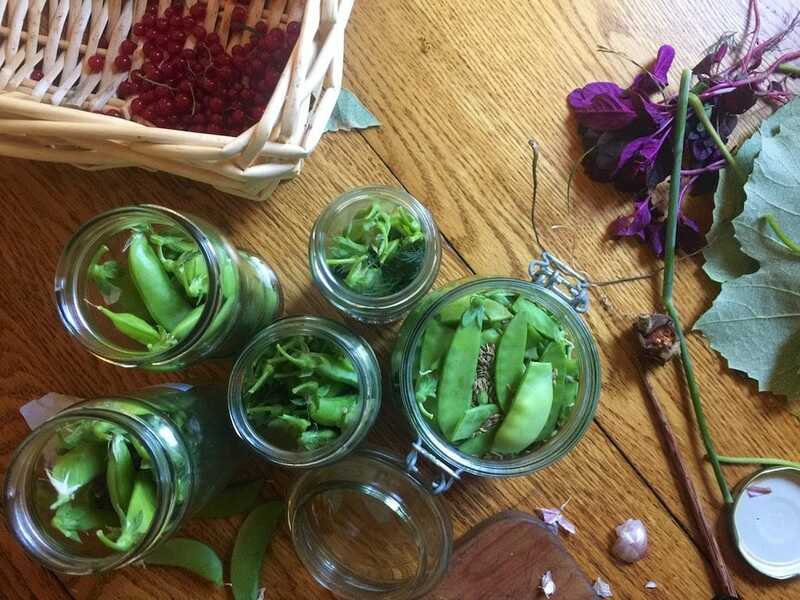 We ran out of our friends kidney bean seed halfway through, so ended up planting kidney beans from the fruit + veg shop, figuring that if any germinated it would be better than nothing. All germinated well and it’s hard to tell the two batches apart now. Above the cottage is more climbing tomatoes (unaffected by the yellow-leaf problem of the top gardens’ tomatoes) surrounded by dill and calendula. And zucchinis. We’ve only got three zucchini plants in this year and still we’re struggling a little to keep up with eating them. Lucky they’re delicious. Lots of fritters and cakes and frittatas and pastas with zucchini and garlic as the central ingredients happening here. 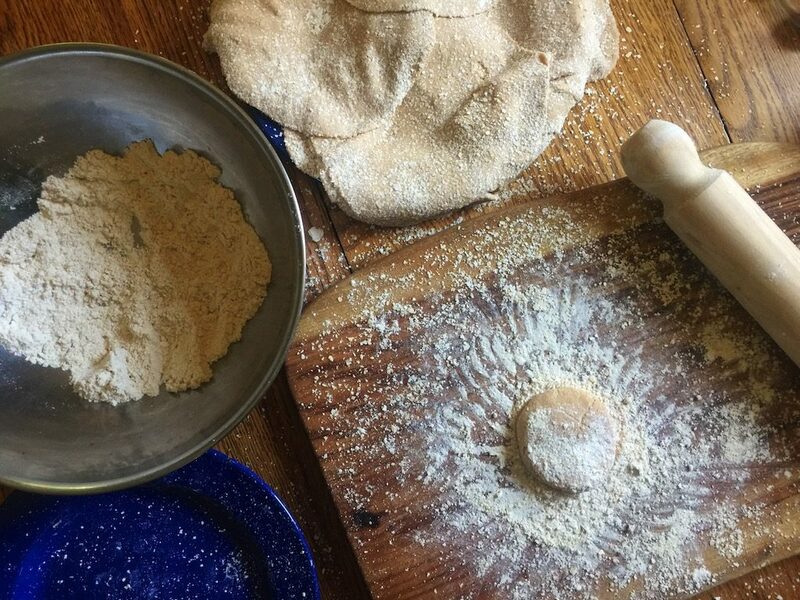 Quick and easy meals on hot nights. 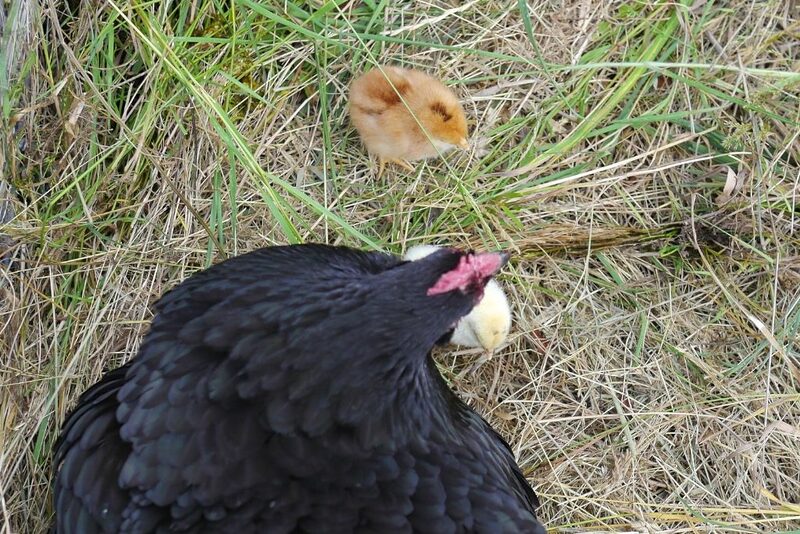 The chickens are all back on the lay, and one proud and broody mamma chook hatched out 3 little fluffy ones. 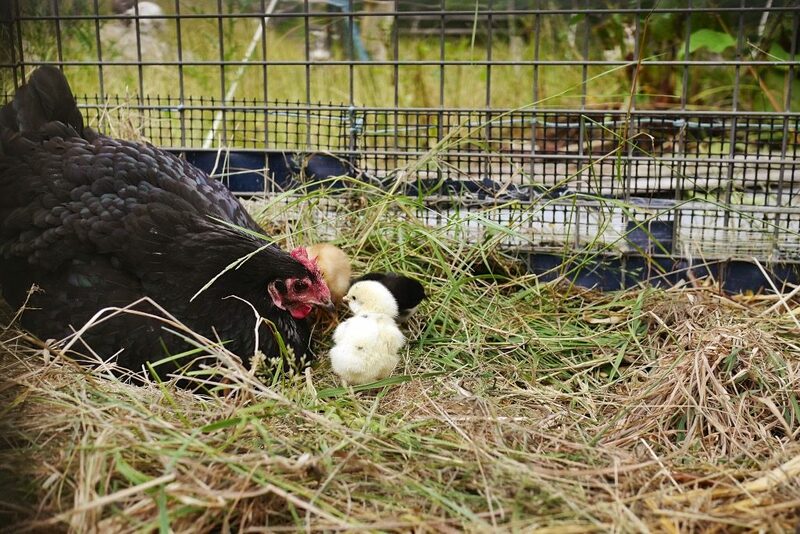 With the addition of two other day-old chicks from a friend, she’s now rearing five little ones under the cool of the feijoa hedge, inside a chicken tractor. 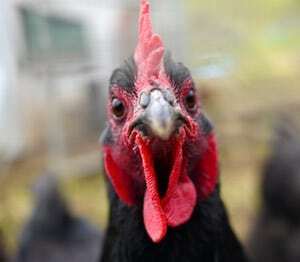 They cheep and scratch all day as we work in the garden next to them. Such a happy sound. The corn is starting to rise high as the real heat of summer sets in. 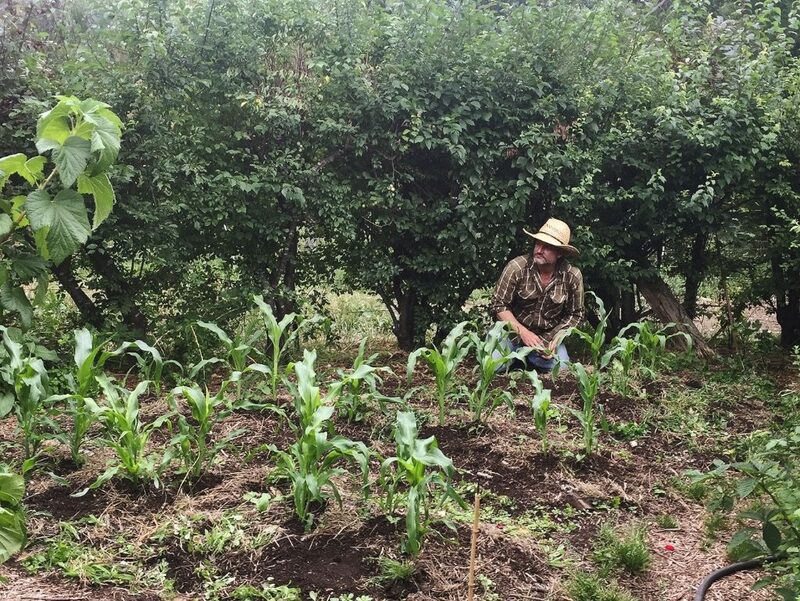 There’s a sweet corn patch up in the main garden next to the tomatoes, and a ‘three sisters‘ patch of maize corn, climbing beans and trombonicum zucchinis (which scramble across the ground and store like butternut pumpkins) down in the greywater runoff garden. The two dams on Melliodora are unusually full for this time of year, thanks to all the late spring rain. The geese think this is an excellent turn of events, as do the many local frogs, ducks, kookaburras and waterbirds. Two grey herons look very much like they are considering nesting in a tree above the top dam. Down the gully and in the streets all around, the cherry plums are starting to ripen. Some are self seeded trees, some indicate where old gold-rush era shacks once stood, some are in established gardens but hang over the fence (all fair game in our books). We’re checking the various plum trees within our orbit regularly and I’m pretty sure that by the end of this week we should be in business. The picking + processing may go on for months. We will become a plum-based people. And then there’s the summer holiday aspect. 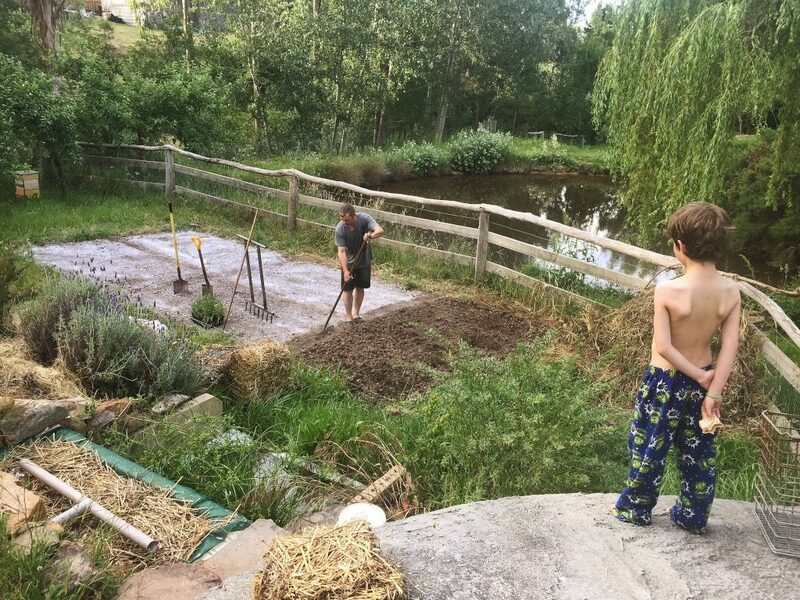 Daily delight and also some frustration as Nick, I and Ashar all try to do everything that both Milkwood and the farm requires of us, while also doing all the family stuff that summer holidays makes possible. The treehouse build in the 150 year old pear tree is off and running. Big brackets, made of dump-scrounged metal, will hold a hanging platform that’s sturdy and solid, but which keeps old grandma pear tree safe too. Nick is a ball of pencils and rulers and plum bobs and screws. Soon he will become a walking, spiky bundle of salvaged wooden joists and noggins and floor boards, and making a constant hammering-into-wood sound. And then, soon, there will be a treehouse. And the main summer holiday project will be done. A tree bedroom for Ashar (apparently he’s going to sleep there ’till winter) or at least a leafy day retreat for reading and surveying the rolling waves / city / lake / whatever the orchard slope is that day. 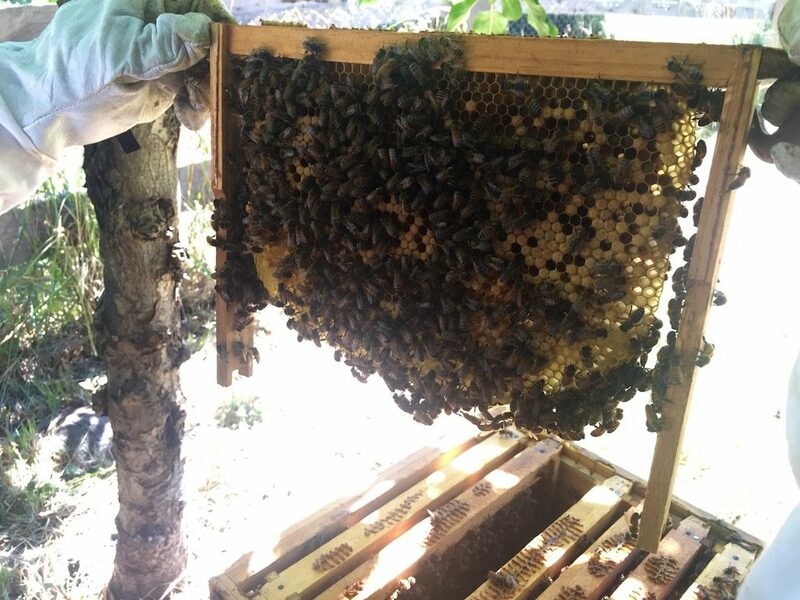 My hands smell of smoke because we checked on the bees just then, and added another box beneath each warré hive for the colony to expand into. Both hives are swarms caught this spring from Su’s hives up the top of Melliodora. They’re doing well, though we may not get much, or any, of a honey harvest this first year. 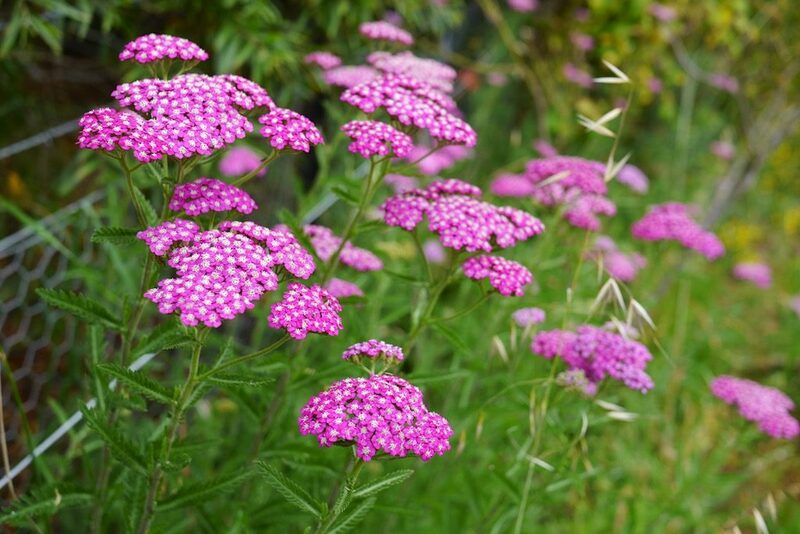 No matter – the bees are calm and the queens are laying well. There’s still time in the season for the messmate (Eucalyptus obliqua) in the nearby forests to flower, which the old beekeepers of the area think it will do this year. If that happens, we might have a serious honeyflow on our hands. And then the bees will build comb and pack it with honey as fast as they can – there will be plenty for all. We wait and we watch. Learning this new place. 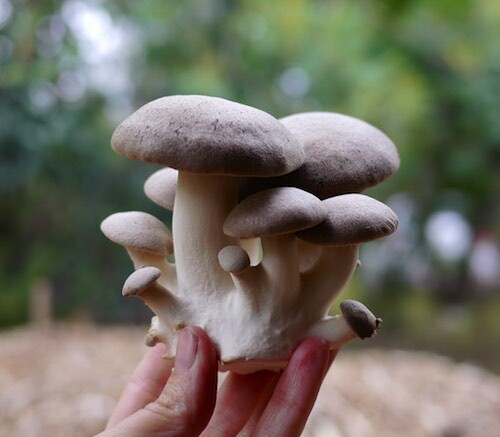 In between and around all this abundance and seasonal work, there’s the everyday things. Baking bread (or not, when it’s too darn hot), washing clothes, making evening campfires, reading new books as the twilight comes down. 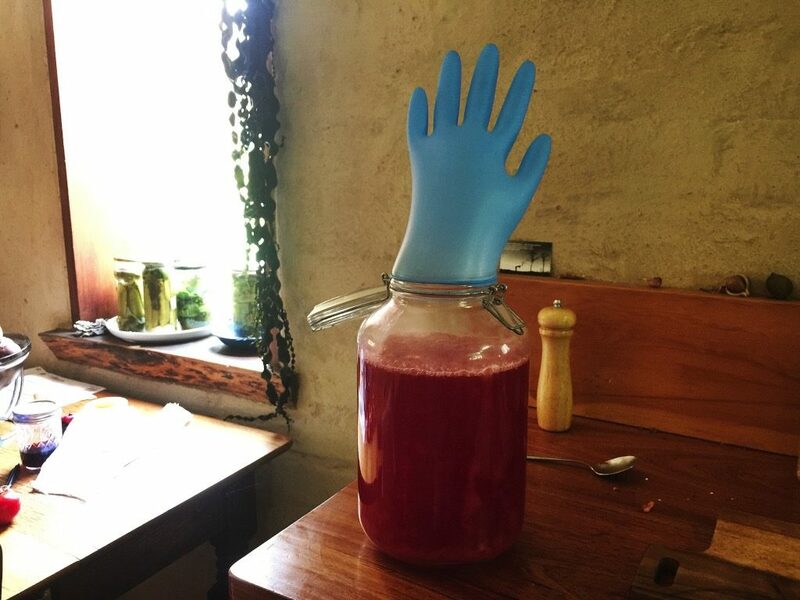 Making brambleberry mead. Running the educational engine of Milkwood. Checking on everything. Keeping the wheels spinning. Wondering what the year will bring. Planning community beekeeping + seedsaving groups. 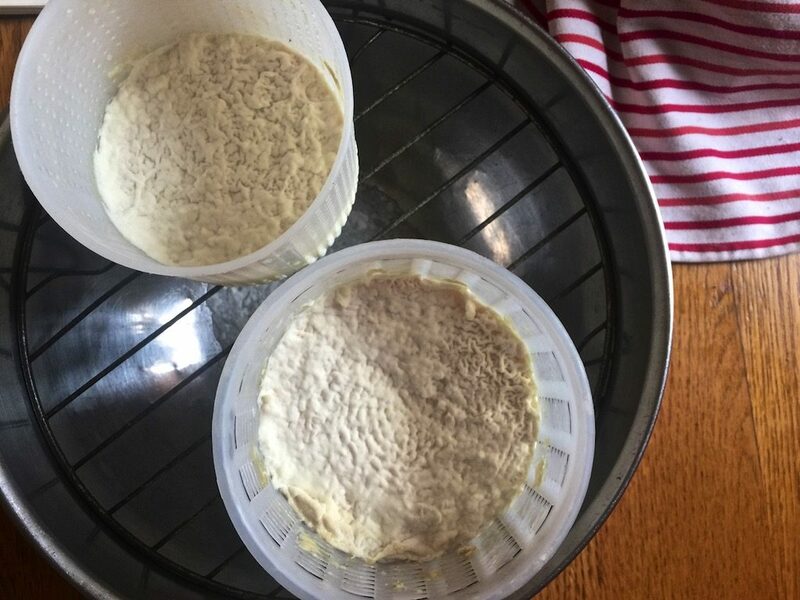 Learning to make really good feta cheese from scratch (so good – make some immediately). Checking in at the tip shop regularly for the long list of things we need, but don’t need urgently – more wood, another metal bathtub, a squarish wooden table. It feels like the calm in the eye of the storm, just now. 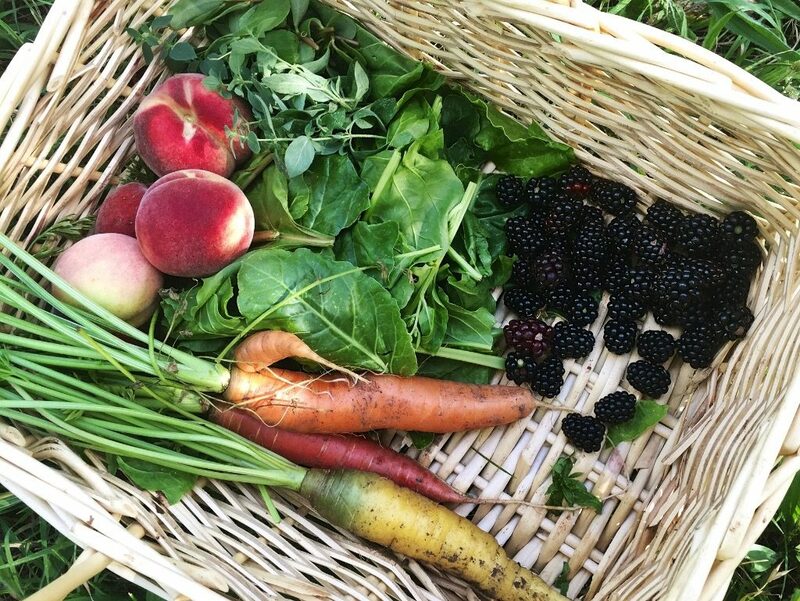 Soon the plums and the apples and the eggplants and the everything will ripen and need harvesting and processing, to support + restock the year-round pantry. It will be time to plant more seedlings very soon. And to save seeds for next season’s seedlings. Time to build another big compost pile. Time to go back to school. Time to take on late summer, and then autumn. In the meantime, we work and we stretch and we swim and we sleep and we read to each other in the evenings, and we watch. Learning this new place. Rarely have two books landed on our kitchen table at once that . .